There’s a reason why it’s called a dish. 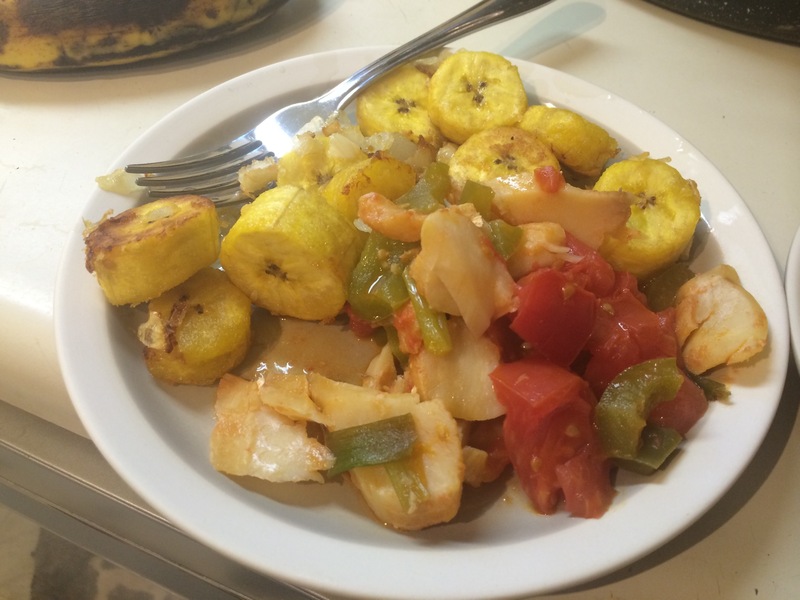 I was reminded of this while cooking the national dish of St. Kitts and Nevis, stewed salt fish with plantains. I should not have mixed the green onions, pepper and tomato… because the tomato goes in separately. Oops. I’ve always been pretty keen on geography. There was a time in my life that I could name the capital of every country. Sporcle quizzes are fun ways for me to pass the time. Somewhere in my lizard brain, this blog is probably a manifestation of my appreciation of maps. That being said, I have no clue where in the Caribbean one would find St. Kitts and Nevis. I don’t find this to be particularly problematic. St. Kitts and Nevis has roughly the same population as Sheboygan, Wisconsin or Twin Falls, Idaho. It’s one of the least populous countries on the planet. From what I could tell, it appears to have established its independence in large part so that the French and English would stop arguing about what European country was owed its colonial loyalties. And, for the record, the islands of St. Kitts and Nevis are at about 1 o’clock on the arc of the Lesser Antilles, with Puerto Rico at midnight and Caracas at six o’clock. So, there’s your geography lesson. As for this dish, it was definitely more than the sum of its parts. At various stages of cooking, I’d taste the salt cod, and find that I didn’t particularly like the flavor. But after it was all put together, this was a perfectly fine dish – not a national food, a national dish. 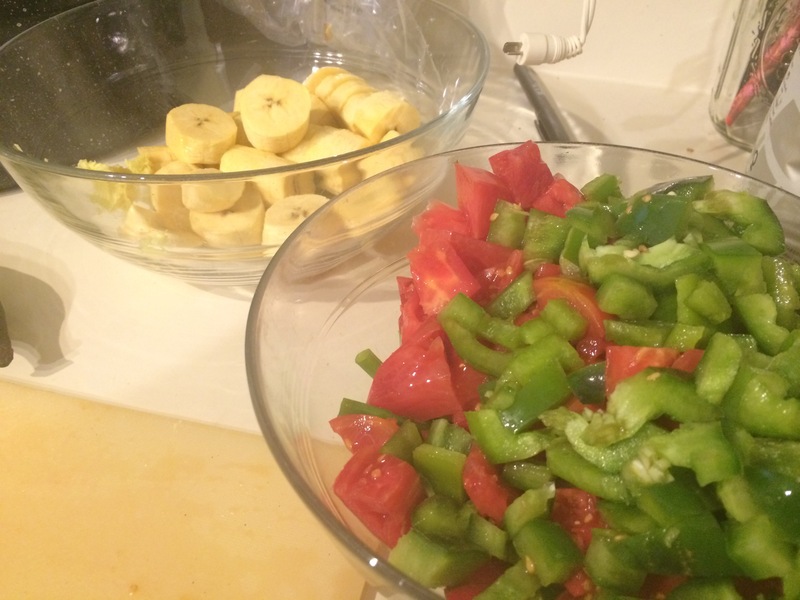 The tomatoes and peppers worked well with the fish, and the plantains added a bit of sweetness to it. 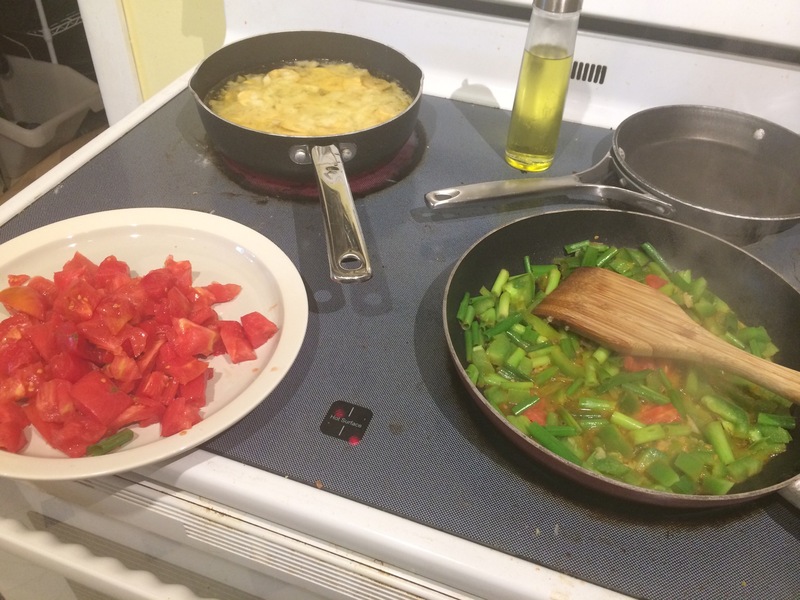 Frying up vegetables and plantains. Soak saltfish for 2 days, changing water frequently. Boil in fresh water until tender. Drain fish. Heat oil in a saucepan. Add pepper, green onions and garlic. Cover and cook over low heat for 5 minutes, stirring occasionally. Add the tomatoes and simmer over moderate heat until heated through for about 5 minutes. Add the saltfish, and stir fry for about a minute. Arrange the saltfish on a plate. Sprinkle with parsley and serve with spicy plantains. Combine plantains, ginger, onion, salt and hot sauce in a bowl. Toss until mixed. Fry in batches until golden brown and cooked. Remove and drain on paper towels. Serve alongside saltfish. A happy Friday night meal.